Cultural Compulsive Disorder: The Legend of Korra Looks Amazing!!! 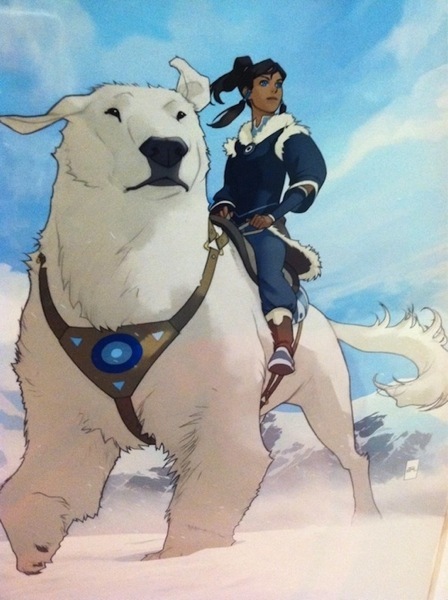 The Legend of Korra Looks Amazing!!! I am sifting through the immense amount of Comic Con related news to come out of San Diego this week (there is alot to come this week, no worries), but one of the coolest things I have seen thus far has to be the first look at Nickelodeon's sequel to Avatar: The Last Airbender that is called The Legend of Korra. The show was announced a while back, but this is the first look at Korra in action. Not to mention it features Naga, her gigantic polar bear type dog that Korra rides (and hopefully gets in on the fighting). This one could end up being better then the story of Aang, which would be quite a feat since the original Avatar cartoon was almost perfect. This one takes place 70 years after the first show, and will featuring Korra trying to master all four elements to become the next Airbender. She will have help from Tenzin, Aang and Katara's son from the first series. I am in. How about you guys? Tell us what you think in the comment section below.